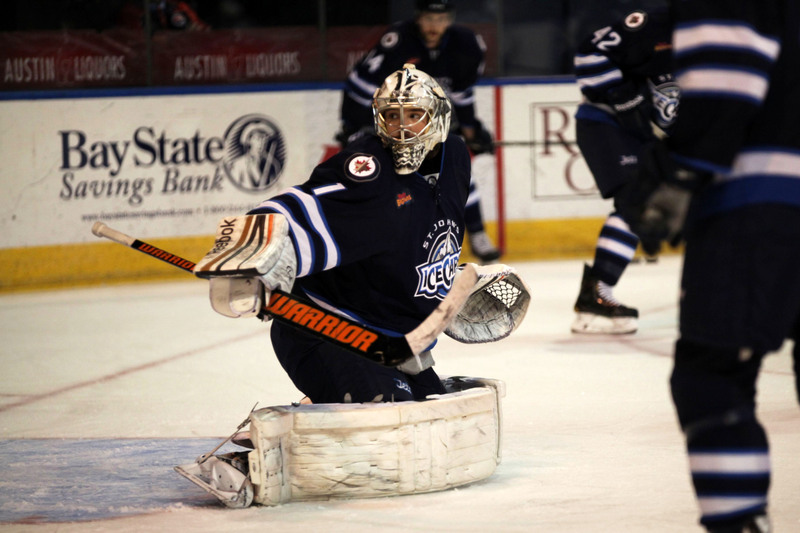 4th year goaltender Tyler Beskorowany(1) signed an ECHL contract with San Francisco Bulls to start his first campaign as an unrestricted free agent. In 32 games he kept an uneven team competitive with a 14-13 mark but was shelled with pucks each night and didn’t have the best GAA or SV% stats to show for it. He was originally a Dallas Stars‘ 2nd round pick in the 2008 draft (#59 overall) and signed a 3-year entry level deal through 2012/2013 but was not qualified. The big 6’5″ 295 lbs. net minder excelled pretty well as a rookie with AHL affiliate Texas Stars in a split season with Idaho Steelheads, where he put up similar, slightly better numbers with a winning record. He wasn’t as lucky in his sophomore year and maybe even shouldered some of the blame for the team’s 2nd to last worst placing. For the final run of his terms, he slipped on the depth chart and was relegated to the Pacific Northwest. He seemed to take the move in stride, playing pretty well and backstopping the Steelheads into a second Kelly Cup Playoff round. He was probably relieved when the Bulls‘ management decided to close up shop on a financially busted second season, leaving him once again free to find another cage to call home. In stepped Orlando Solar Bears and in 2 games he’s got two victories with a 1.50 GAA and .940 SV%. A needy St. John’s IceCaps noticed that and a month ago signed him to a pto. He’s only been between the pipes once, and although he won the game was victimized for 5 goals on 36 shots. He started the 2013/2014 season in training camp with Worcester Sharks before being released. Depending upon how deep his current club can go in the postseason, it seems doubtful the 23-year old Sudbury, Ontario native will stick with North America after this year. 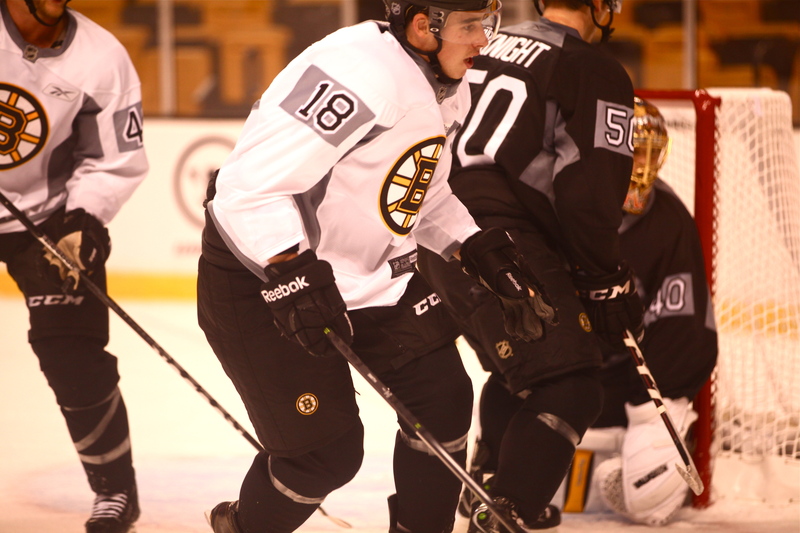 2nd year right wing Reilly Smith(18) makes his 2013/2014 season debut on the opening night roster of his new team, Boston Bruins. 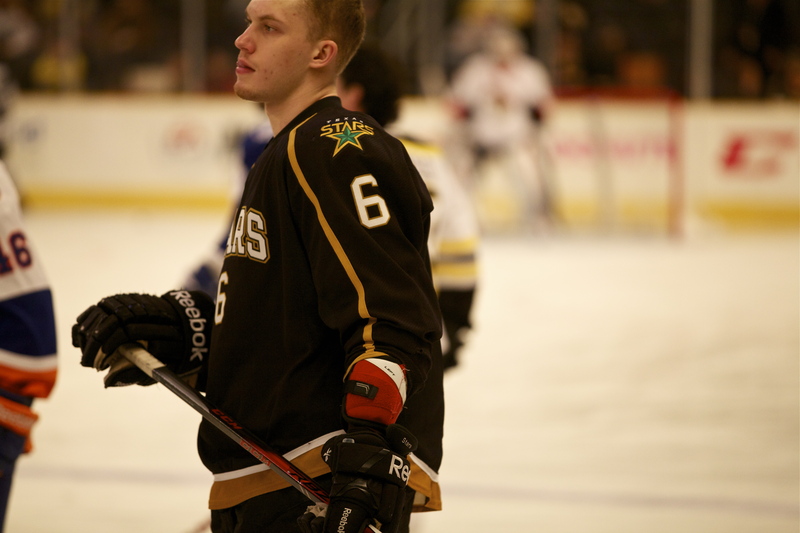 He was originally a Dallas Stars‘ 3rd round pick in the 2009 draft (#69 overall) and skated 38 NHL games in his rookie campaign on up and down recall with AHL affiliate Texas Stars. He put in 3 goals and 6 assists on the top level and added another 14 goals and 21 assists in 45 minor league games. The 6′ 185 lbs. forward also skated in 3 NHL games after finishing up his playing career at Miami University. He was a point-per-game guy in college pocketing 66 goals and 56 helpers in 121 contests. He’s signed to a 3-year entry level deal through the end of the current season but will easily get qualified. The 22-year old now just needs to prove he should stay with the parent club. 4th year center Matt Tassone(26) bounced around lots last season and somehow ultimately ended up skating in 5 Kelly Cup Playoff games with Elmira Jackals scoring three points, a pair of goals and an assist. Making sense of his movement through the 2012/2013 campaign is a whole other deal. Initially the 6′ 200 lbs. 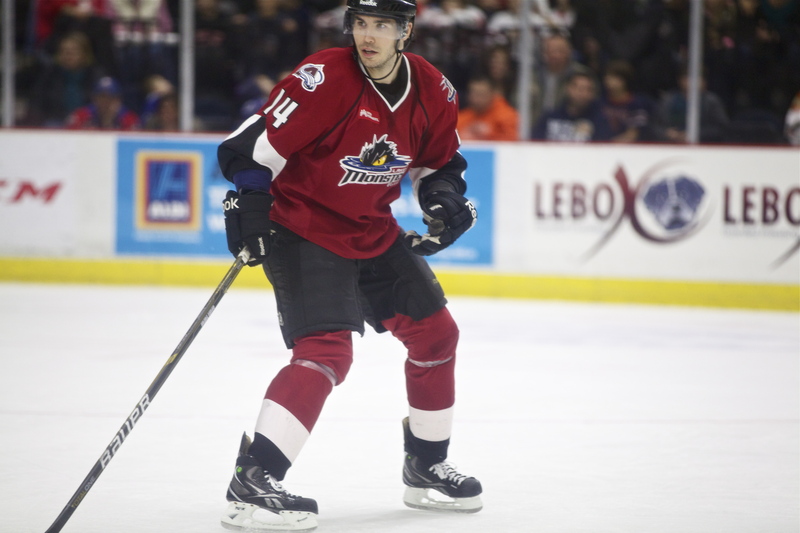 forward was signed to an AHL contract by Lake Erie Monsters but was either released or reassigned and inked with Wichita Thunder before moving on within the Central Hockey League to Arizona Sundogs and then getting recalled by the Monsters and signed to a pto, where he appeared in 13 games scoring his first and thus far only league tally. He was originally a Dallas Stars‘ 6th round pick in the 2008 draft (#176 overall) but never came to terms with them and eventually bounced down to their farm club, Texas Stars. This lasted no time though, as they sent him to their ECHL affiliate Idaho Steelheads. As a rookie he played 32 games generating 10 points but also suffered injuries that sidelined him for a good chunk of the year. For his sophomore season he signed with Ontario Reign but was once again was challenged to stay healthy and eventually released before the end of the regular season. Once again, for 2013/2014 he commits to another ECHL team, Las Vegas Wranglers. The 23-year old seems poised for a breakout on the score sheet and it wouldn’t be a surprise to see him join the 20/20 club or better. 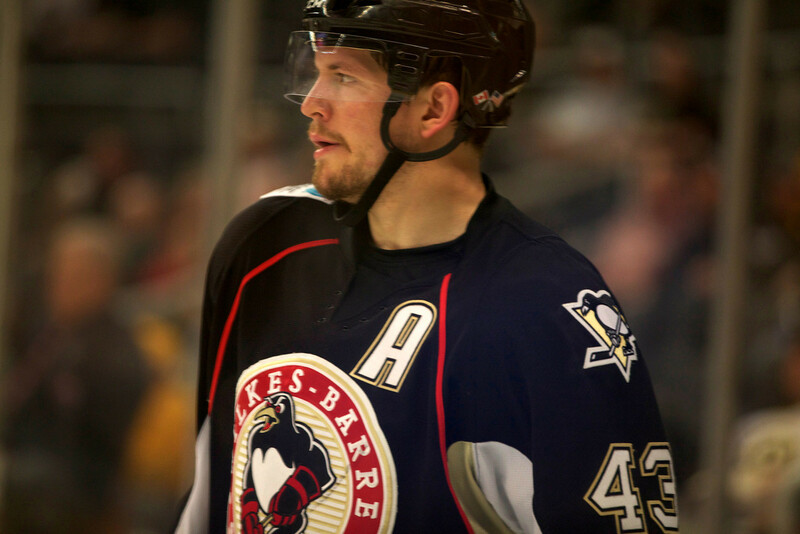 4th year, former Pittsburgh Penguins‘ 2nd round pick in the 2006 draft (#32 overall), towering defenseman Carl Sneep(4) somewhat surprisingly signs a one-year deal with Idaho Steelheads for 2013/2014. He was originally signed to a 2-year entry level deal in which he appeared in his only NHL game and even recorded his first big league point, an assist. He also suffered injuries that limited his play in his sophomore campaign. The 6’3″ 220 lbs. blue liner was extended for another season but something seemed to go amiss as he was inserted into the Wilkes-Barre/Scranton Penguins‘ lineup for a mere one appearance and spent most of his time watching from the stands before being reassigned to Wheeling Nailers, where he skated in 29 games before being dished to Dallas Stars. He played 25 games with Texas Stars and received one recall but did not skate with the parent club and was once again bounced on loan late in the season to Peoria Riverman. Not surprising, his point totals suffered, probably from changing addresses so much but he was never really viewed as a big point-getter since high school hockey. He’s more of a big shutdown d-man that is tough to play against and holds a highly accountable +28 rating in 133 AHL games; and added another +12 in 29 ECHL games, but also was able to put up some marks on the score sheet (3 goals, 12 assists). With his big frame though, he could easily put a bit more punishing grit into his style of play. In four years with Boston College Eagles he was a part of two national championship teams. 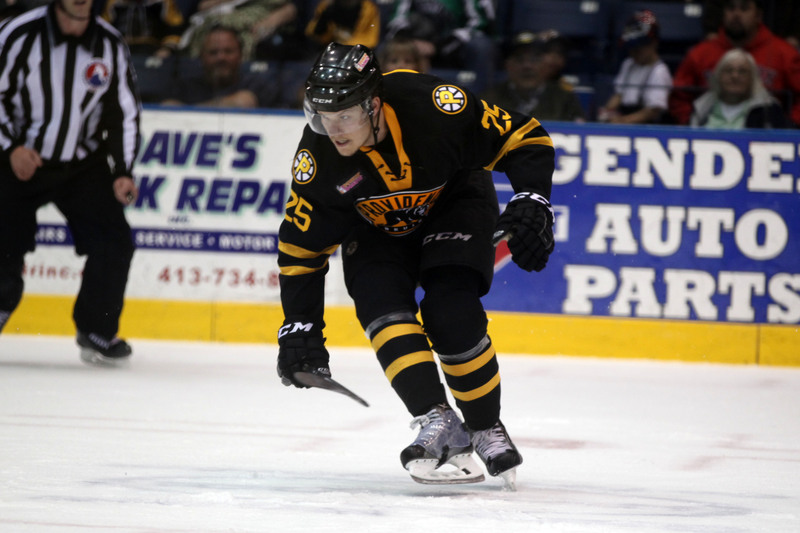 Joining Idaho may be a strategic move for the 25-year old, as it would be no surprise to see him attend affiliate Texas Stars‘ training camp, rejoining the team and log some miles between the two western states. Undrafted 10th year center Warren Peters(43) is the type of veteran skater you want on your team come playoff time for his on ice determination and game leadership he brings. An unrestricted free agent after two seasons in the Minnesota Wild system, he signed a one-year two-way contract with Pittsburgh Penguins that’s seen him contribute with all the aforementioned qualities during the regular season, but in the postseason with AHL affiliate Wilkes-Barre/Scranton Penguins it’s on a whole other level. It’s also good reason for him to wear an assistant captain “A” on his sweater. The 6’1″ 209 lbs. forward has made it to Calder Cup Finals in two of the last three seasons, first with Texas Stars and followed it up with Houston Aeros. He’s appeared in 96 NHL with 3 different teams in each of the last four seasons (4 goals, 4 assists) and only likely didn’t receive a recall this season due to the shortened campaign. As a player that started his career in the ECHL and even spent his entire sophomore season in the league during the other most recent lockout, we can appreciate the fact that he’s worked his way up to the show with lots of hard play and persistence. The 30-year old is back on the market this summer but chances are the Penguins will offer him a one-year extension. Dallas Stars‘ undrafted, 2nd year left wing Matt Fraser(25) appeared in his 2nd NHL game on his 1st recall of 2012/2013; and scored his first big league goal to start the game, which unfortunately ended as a 5-4 OT loss for the team. He skated 15 shifts for 9:52 total ice time with his only shot on net being the tally and ended the night with a +1 rating. Not too shabby for the 6’1″ 204 lbs. forward that amassed triple digit penalty minutes in his last three seasons of junior hockey but also average a point per game in his final two years. In two campaigns with Texas Stars, he has kept up his marks on the scoresheet, running 37 goals and 18 assists as a rookie and continues to strike in his sophomore season with 24 goals and 11 assists. He was also chosen to represent his team at two consecutive AHL All-Star Games. Signed to a three-year entry level contract, the 22-year old’s next score looks to be a 2-year contract extension to continue his development right where he’s at. Dallas Stars‘ 1st round pick in the 2011 draft (#14 overall), mammoth-sized defenseman Jamie Oleksiak(6) made his NHL debut after starting his rookie season with their minor league affiliate Texas Stars. He skated 21 shifts for 15:32 of total ice time in a 4-3 shootout win. At 6’7″ 254 lbs. his size speaks for itself but he started to show an offensive upside in the second half, after a trade, of his only year in junior hockey. That followed one season in college hockey. In 43 AHL games he has scored a modest 3 goals but added a playmaker 20 assists to his scoring totals and leaves the farm club (for now) with a +12 plus/minus. 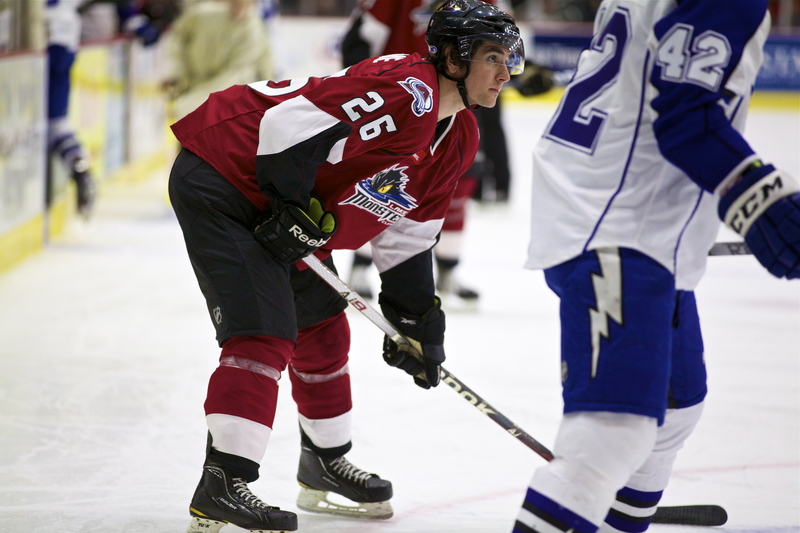 He also was selected to the starting lineup of the recent 2013 AHL All-Star Game and Skills Competition. The 20-year old signed a 3-year entry level contract that keeps him in the Stars‘ system through 2015. He should easily become a full-time fixture in the show well before then as a solid two-way specialist. 12th year former Washington Capitals‘ 1st round pick in the 2000 draft (#26 overall) center Brian Sutherby(14) started the season on a pto with St. John’s IceCaps but was released after being a healthy scratch from the first two games. Two and a half months later, the 30-year forward signs a standard player contract with Lake Erie Monsters. A veteran of 460 NHL games with Anaheim Ducks and Dallas Stars and the Capitals, he’s quite literally under-scored where he should be with only 41 goals and 49 assists. An unrestricted free agent last season, he signed a minor league deal with San Antonio Rampage but failed to produce as they would have liked and was released. He spent the rest of the year sidelined with back ailments. In 85 AHL games he’s scored 13 goals and 31 assists. At 6’2″ 209 lbs. he’s built like a power forward and skates like one. Despite having no points in 5 games with the Monsters, he really seems to fit into this team pretty well, making sure that if he has yet to quite hit the scoresheet yet, he’s still a big pest to play against. Diminutive, undrafted 7th year right wing Chris Conner(14) has played NHL games with three different teams through the first six seasons of his pro career. The 5’7″ 180 lbs. forward has skated in 147 games with Dallas Stars, Pittsburgh Penguins and Detroit Red Wings‘ last season amassing a total of 17 goals and 26 assists. He has also appeared in 297 AHL games scoring 88 goals and 147 assists in regular season action. For the 2012/2013 season, the free agent signed a one-year, two-way deal with Phoenix Coyotes and has been reassigned to their affiliate Portland Pirates. Through 23 games with the team, he’s definitely been a leader on and off the ice, is on pace to put up career highs in all categories and has helped the club into solo possession of 1st place in the Atlantic Division through the Christmas break. With the NHL lockout in effect, the 29-year old could have found himself a bit of a home for at least another campaign and should get continued big league looks from the parent club once they start playing hockey again.